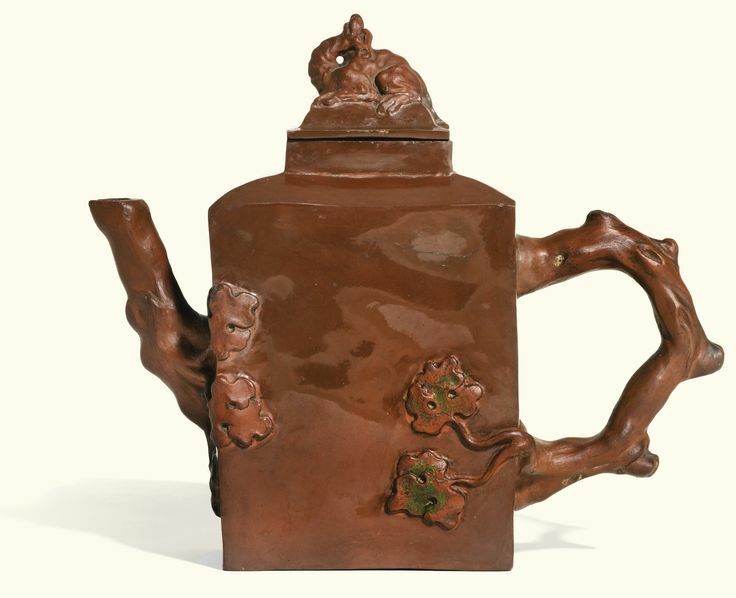 A German polished stoneware teapot and cover, perhaps Plaue, circa 1720. Estimate 2,000 — 3,000 GBP. Photo Sotheby’s. 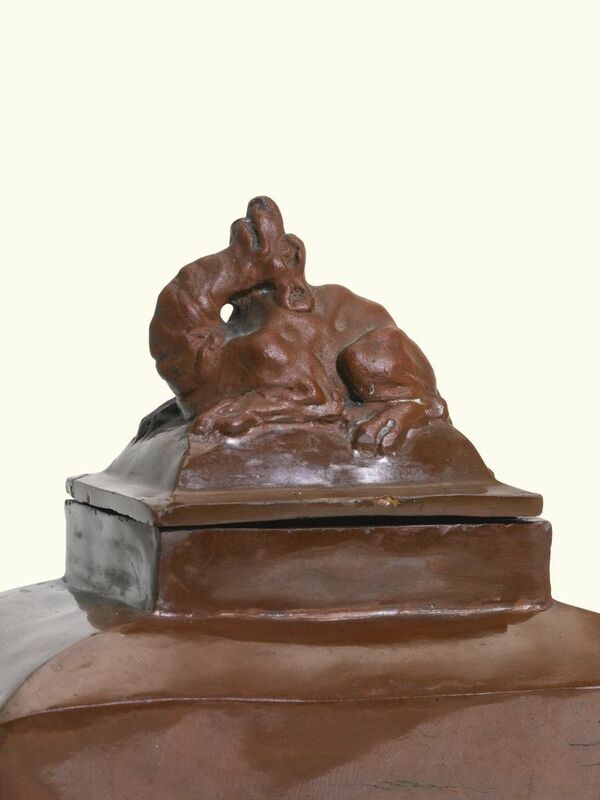 Note: The stoneware rivals and successors to Böttger’s stoneware are rare and under-researched. Most, however, used a coarser, lighter material incapable of taking the polish of the lapidary’s wheel. At Plaue, however, a very hard body was developed, and some ambitious pieces produced. Perhaps the best-known of these is a tea kettle in the Arnhold collection, exhibiting the same uneven modelling and striated clays as the present piece, together with the close-textured, unglazed spout; see M. Cassidy-Geiger, The Arnhold Collection of Meissen Porcelain, 1710-50, no.382, pp.720-722. A famille verte ‘Provinces’ dish, circa 1720. Estimate 7,000 – $10,000 USD. Photo Christie’s Image Ltd 2015. 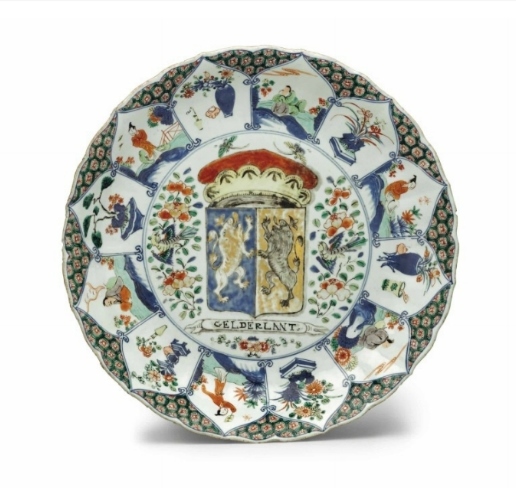 Note: Series of these dishes, in four related patterns, were ordered in China in the 1720’s with the arms of the principle towns and provinces of present-day Belgium and the Netherlands, plus the arms of England and France. 23 different arms seem to comprise each series. 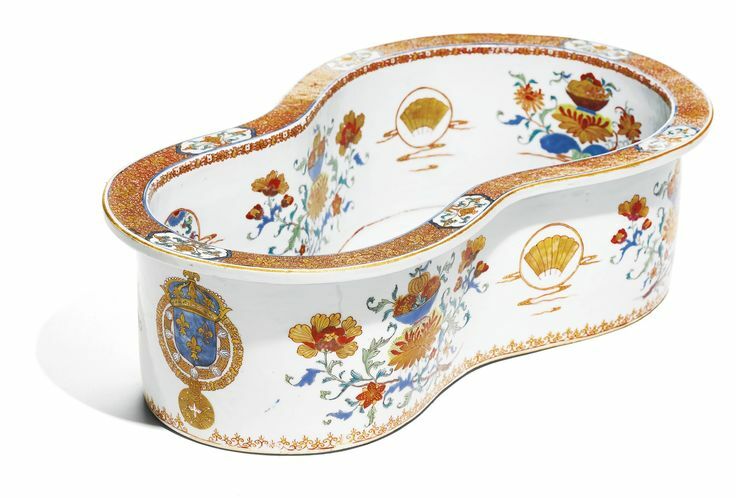 the waisted oval body with straight sides rising to an everted rim, the interior and exterior similarly painted with stylised floral sprays supporting bowls of fruits, divided by roundels variously enclosing fans, lotus and the French Royal arms, the flat rim encircled by shaped floral cartouches on a lotus scroll ground; 52.3cm., 20 5/8 in. PROVENANCE: Cohen & Cohen, London. 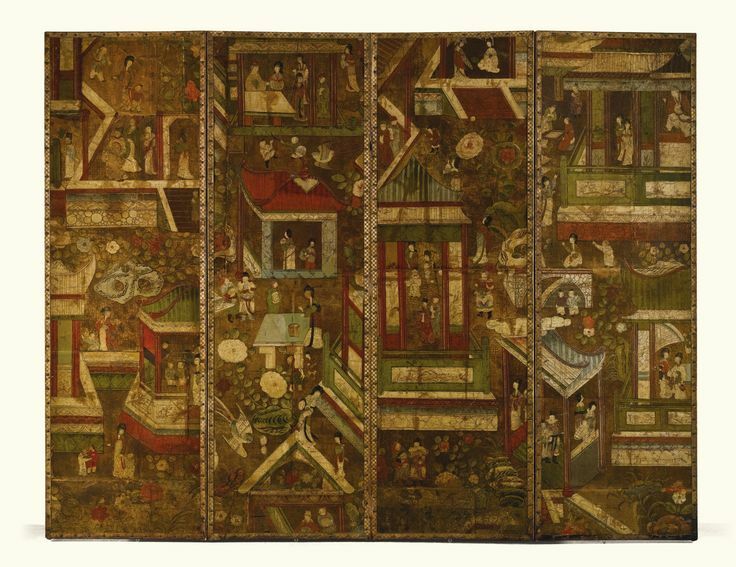 Sotheby’s Paris, 14th June 2007, lot 270. Three various armorial dishes Kangxi-Qianlong. Photo Bonhams. Carter dish: For an example of this service see ‘Chinese Armorial Porcelain’, D.S. Howard, p.197, no.D2. Booth/Irvine dish: For an example of this service see ‘Chinese Armorial Porcelain’, D.S. Howard, p.193, no. D1. A large famille verte and underglaze blue ‘Provinces’ dish, Kangxi, circa 1720. Photo Bonhams. 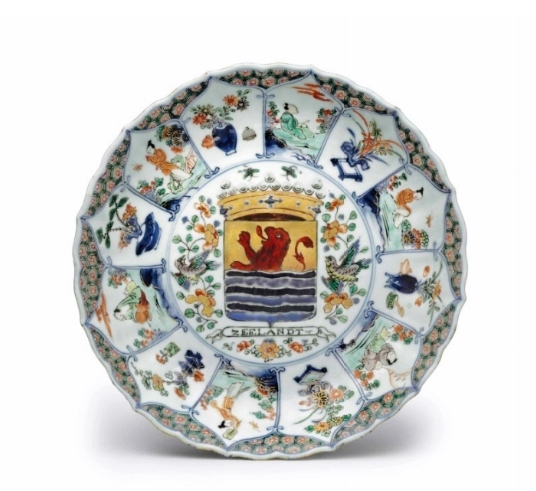 Series of dishes in four patterns were ordered in China in the 1720’s with the arms of the principal towns and provinces of present day Belgium and the Netherlands, plus the arms of England and France. Twenty three different arms seem to comprise each complete series. C. Le Corbeiller has pointed out that the spellings would suggest a Dutch clientele, and that the groupings suggest the borders of this region after the 1713 Treaty of Utrecht which ended the War of the Spanish Succession. In 1717 a Triple Alliance marked the new rapport of England, France and the Netherlands, and Le Corbeiller suggests that the dishes may have commemorated this relationship (China Trade Porcelain, pp.37-39).